When you plan your holiday to Koh Samui, make sure to book a luxurious hotel that will compliment your stay in this gorgeous Thai island. These hotels are indeed la crème de la crème of luxury, elegance, and magnificence and choosing one of them will make your stay that much more memorable and relaxing. Luxury hotels in Koh Samui are located in the most beautiful places and they all offer top of the line services, quality stay, friendly and welcoming staff, as well as a large number of amenities. Depending on the reason why you are travelling to Koh Samui, you can find the perfect hotel for you in our top 10 list of the best luxury hotels. So take a look and you will see that this island has it all, from romantic hotels to family friendly resorts. Located only a few minutes’ away from Samui Airport, the Tongsay Bay is a very romantic hotel that offers its customers virtually anything they might want and need to have a perfect vacation. You can choose among 83 luxury and stylish villas, cottages, and suites. In fact, you can choose Beachfront Suite, Cottage Suite, Special Cottage Suite, Tongsai Grand Villa, Tongsai Pool Villa, and Special Villa. Regardless of which accommodation you choose, stay assured you will be pampered, catered to, and treated with the utmost respect and reverence. With a private beach and multiple pools, you will have the opportunity to relax in the warm sun of the island. The Renaissance Koh Samui Resort & Spa is located in a gorgeous bay at the southern tip of Lamai Beach on Samui east coast. Choose among one of the four charming accommodations: Royal Lamai Villa, Pool Villa, Deluxe Room, and the Lamai & Chomview Suites. This tropical and luxurious hotel is great for family vacations, as well as honeymoons and romantic getaways. With a fitness center, a spa, and a large number of highly praised dining options, you will never want to leave! If you wish to explore the northeast of Koh Samui, you cannot miss staying at SALA Samui Resort & Spa located on Choeng Mon Beach. This incredibly elegant hotel offers many amenities, including minibar, Espresso machine and tea making facilities, DVD player, LCD TV, IDD telephone, and much more. The villas have all a very modern design and they provide maximum privacy as they are tucked away through the entire resort. Can you imagine yourself relaxing on a large daybed while admiring the ocean of the Thai Gulf? If so, don’t waste any more time and book your luxurious room right now! 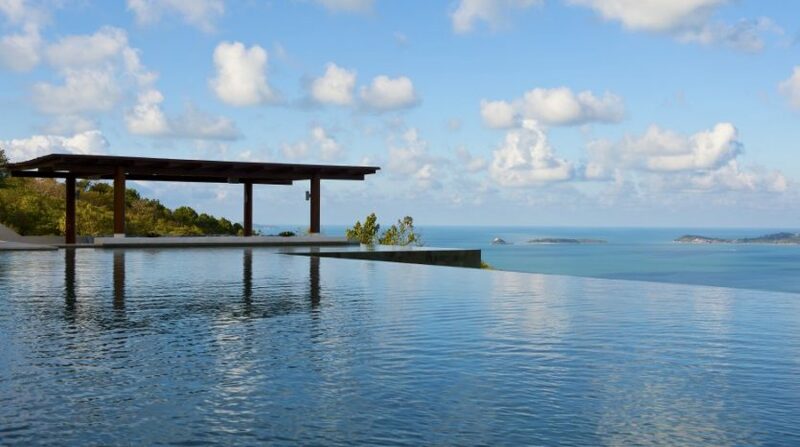 If you are looking for a hotel that offers breathtaking panoramic views, then Mantra Samui Resort is perfect for you, given that it’s located on a hillside only 10 minutes away from the Firsherman’s Village. The hotel offers shuttles that you can take to go sightseeing. At the reception you can also book tours to go visit local hotspots. After a day spent at the beach and touring the island, you can go relax at the gorgeous Spa and Wellness center. Then, finish the day with a delicious meal of contemporary fine dining at the Ubuntu Restaurant. Situated on the east coast of Koh Samui, on the peaceful and relaxing northern end of Chaweng Beach, Anantara Lawana Resport & Spa offer 122 accommodations for you to choose from. This luxurious resort’s key features go from ocean view villas, pool bar, private boat charters, infinity-edge swimming pool, and much more. Also, if you wish to keep fit while enjoying your vacation, there are many different sports to choose from, such as kayaking, golfing, Thai boxing classes, yoga lessons, and even snorkeling. 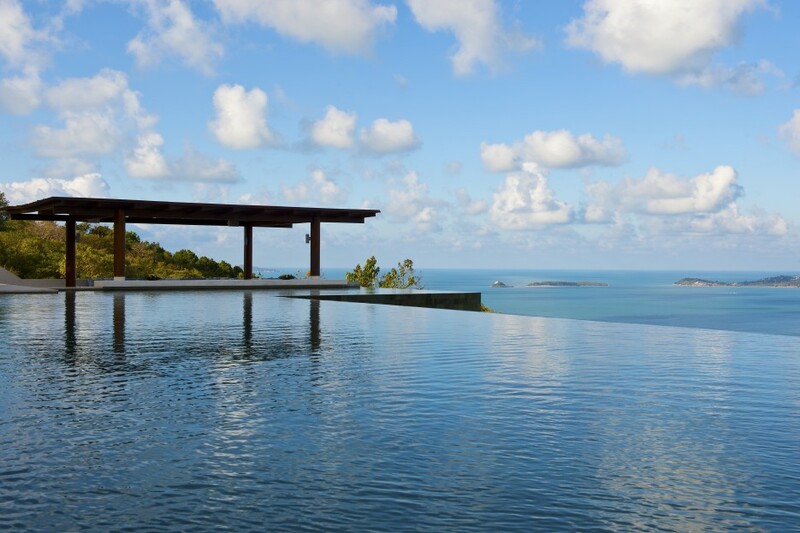 Sareeraya Villas and Suites is located on the gorgeous Chaweng Beach, on the eastern coast of Koh Samui. This five-star hotel offers anything and everything you could ever wish for and want in a luxurious and elegant hotel. Whether you are here to relax on vacation, on a family trip, or to celebrate a special occasion in paradise, you can take advantage of the many features and amenities this place has to offer. With valet service, a spa, a pool for children, as well as free WIFI and internet access to stay connected with your friends and family while away, this resort has it all! Located in a charming and secluded location on Lamai Beach, Silavadee Pool Spa Resort offers its customers six different accommodations to choose from: Deluxe balcony, Jacuzzi Deluxe, Ocean View Jacuzzi Deluxe, Ocean View Pool Villa, Panoramic Ocean View Pool Villa, and Ocean Front Pool Villa Suite. Regardless of which accommodation you choose, you will have your own private infinity-edge pool and an Aqua Jet Massage Bed. This resort can be simply described as luxury at its best! Vana Belle A Luxury Collection Resort Koh Samui is a breathtaking beachfront hotel located on Chaweng Beach. Choose among a variety of dining options, and enjoy the key features of this luxurious resort, which include limousine services, freshwater pool, a top quality concierge team, and even fitness classes such as yoga, Pilates, aquarobics, and Thai kick boxing. Located on Thongson Bay in the Gulf of Siam, northern side of Koh Samui, Melati Beach Resort & Spa is a gem that is sure to compliment your well deserved relaxing vacation. Choose among 77 private villas and suites and fill your day with fun and relaxing activities, including the two swimming pools and a gift shop. Also, if you are travelling with children, this hotel might be just the right one for you as it offers a kid’s pool and kid’s club. Le Meridien Koh Samui Resort & Spa is a five-star resort situated on the rocky shoreline of Lamai Beach. With its gorgeous pool access suites, its 24 hour fitness center, complimentary shuttle services, and even babysitting services, each and every member of your family can truly enjoy and relax their stay in paradise. Whether you are travelling with family, or just with your loved one for a romantic getaway, Koh Samui has a large variety of luxurious hotels to choose from. Each hotel and resort offers a large number of amenities and key features that will surely satisfy every taste. Trust us when we say, you will never want to leave!